Well, we had 3 days last weekend that were flirting with 70, and sunny. And then we had a day with snow. Snow!!! Crazy! I have a great almost summer recipe for you today. Shredded BBQ Chicken Burgers. The chicken is gluten-free, and can be served on gluten-free buns. Leave off the cheese, and it is dairy-free too. It's very adaptable on the serving end. And it is delicious too! We all loved these burgers. Look at the colors and the layers. Barbecue chicken topping guacamole, and topped by cheese. All layered onto chewy hoagie buns! Amazing! The sauce is very tangy. It pairs nicely against the guacamole. -Slice the onion, and place in slow cooker with ketchup, vinegar, sugar, tomato paste, paprika, worcestershire sauce, salt and pepper. -Wash, skin, and pat dry the chicken thighs. Place in the slow cooker with the sauce, and cover with the sauce. -Cook on low for 8-9 hours or high for 5-6 hours. -Once the chicken is done, shred the chicken in the crock pot, using two forks. 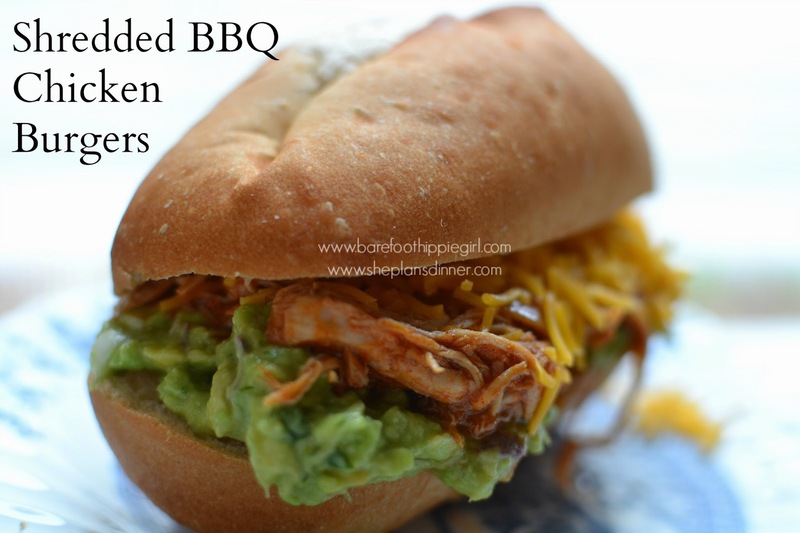 -On each bun, layer a heaping spoonful of guacamole, shredded chicken, and shredded cheese. -Serve sandwiches with tortilla chips and remaining guacamole and salsa. -Peel and pit avocados. Mash in a small bowl. -Dice onion, juice limes, mince garlic and chop tomatoes. Add to avocado. -Wash and chop cilantro. Add to bowl with the salt. -Refrigerate for 1 hour or serve immediately.